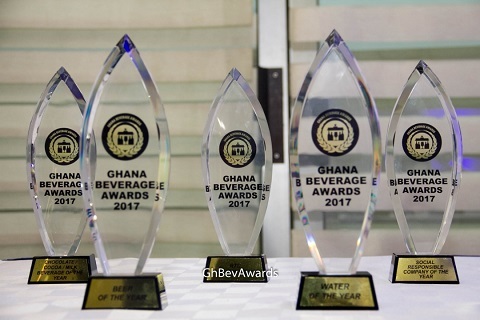 Ghana News-Ten companies were last Friday awarded at the second edition of the Ghana Beverage Awards (GBA) held at Alisa Hotel in Accra. Guinness Foreign Extra Stout (FES), was adjudged Product of the Year and Beer of the Year while Manufacturer of the year went to Coca Cola Bottling Company. Fruit Juice of the year went to Blue Skies and Energy Drink of the year was swept by Storm Energy. GBA is an awards scheme which aims at honouring excelling beverage stakeholders in Ghana for their contribution to the country’s economy. The CEO of Global Media Alliance, Mr. Ernest Boateng, said while delivering the closing remarks that, “It is evident that there are exciting times ahead for the Ghanaian Beverage industry and seeing what the key players are doing is a clear demonstration that there are good things in the pipeline. As a company, we see a very positive outlook in the coming years and we do want to assure all stakeholders that we are going to do all that is possible, working with you, to ensure our beverage brands have the International recognition”. The Special Guest of Honor, Mr. Yofi Grant, CEO of the Ghana Investment Promotion Centre expressed his excitement about the support of made-in-Ghana products through the event. He also reiterated that GIPC is working tirelessly to make Ghana the best place for investment in Africa. Activities at the event included a spectacular jazz performance by Mizter Okyere. Organised by Global Media Alliance, the second edition was themed “Inspiring Excellence in the Ghana Beverage Industry”. Global Media Alliance collaborated with recognised institutions such as the Food Research Institute (FRI) under CSIR, Consumer Protection Agency (CPA), Food and Beverage Association of Ghana (FABAG) and the Ghana Tourism Authority (GTA). The event brought together different stakeholders in the Beverage industry.